The Vice President of India, Shri M. Venkaiah Naidu has said that the language used in the courts should be understood by the petitioners who are seeking justice. He was addressing the gathering after inaugurating the new building for Allahabad High Court, in Allahabad, Uttar Pradesh today.The Vice President told the judges and members of the Bar Association that while our Constitution envisages independence of judiciary from the executive, the Legislature and Judiciary should share healthy mutual respect and should complement each other. He reminded the Judges and members of the Bar Association of the crucial historical milestones witnessed by the Allahabad High Court, like the trial of the Chauri Chaura case, the Meerut Conspiracy case and the INA Trials.The Vice President proclaimed that Judiciary is a key pillar of our democratic polity and suggested that judiciary should strengthen democracy by ensuring speedy justice, even handed justice and justice that is perceived to be entirely fair. He lamented that there was a huge volume of cases pending in Indian courts. He recommended that Courts must make use of innovative tools such as Lok Adalats, Gram Nyayalays and Fast Track Courts for speedy justice disbursal.The Vice President advised that the endless possibilities of Information Technology should also be fully exploited to make procedures more transparent and less cumbersome. He underscored the importance of the use of local languages in the procedures of Courts in India for their easy comprehension by the common people. The Vice President expressed his deep concern at the existence of a large number of unfilled vacancies in the judicial system and expressed hope that the efforts being made by the government to bridge the gap in human resources would bear fruits soon. He acknowledged the dedication of the Judges of the Allahabad High Court who agreed to dispose urgent criminal cases during the vacations.Applauding the functioning of the National Judicial Data Grid which found place in Ease of Doing Business Report for 2018 for facilitating the enforcement of commercial contracts, the Vice President said that we should avoid delays in judicial litigations and create a robust regulatory architecture to inspire more confidence among investors.The Vice President spoke about the rise in the number of cyber-crimes which have opened up an all together new dimension in jurisprudence. He added that Cyber-crimes and their ramifications transcend defined jurisdictions and expressed hope that the courts would equip themselves to deal with them. He emphatically spoke about the need to implement Anti Defection law, with sincerity and also fast track disposal of election petitions.The Vice President also touched upon the need to be cautious about invoking provisions in law that have a bearing on the stature of constitutional and judicial authorities like impeachment proceedings.The Vice President urged the courts to stand by the truth at all times so that each citizen will feel confident that truth alone would triumph in this country. 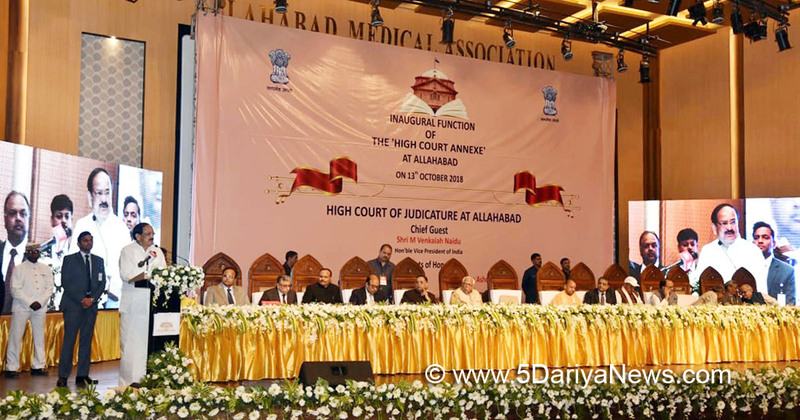 The Governor of Uttar Pradesh, Shri Ram Naik, the Chief Minister of Uttar Pradesh, Shri Yogi Adithyanath, retired and sitting judges of Allahabad High Court, Judges from Supreme Court and eminent legal luminaries were present on the occasion.